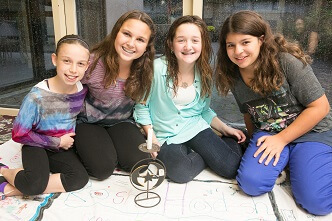 Moving Traditions, and it’s successful program, Rosh Hodesh: It’s a Girl Thing!, are among the innovators receiving support through the new Jewish Teen Education and Engagement Initiative, which is managed and partially funded by Rose Community Foundation. Dash Sperling may be only 17, but he already knows a good investment when he sees one. He is co-chair of Rose Youth Foundation (RYF), a youth-led philanthropy group for Jewish teens and a program of Rose Community Foundation. Sperling and RYF recently awarded a grant to our new Jewish Teen Education and Engagement Initiative, making them the first teen investors. Their investment builds on more than $5 million in support for a four-year initiative designed to dramatically increase the number of teens involved in Jewish life and learning in Greater Denver. The effort is being driven by a new partnership between Rose Community Foundation and the Jim Joseph Foundation, one of the largest Jewish education foundations in the world, and is drawing numerous organizations, funders and partners together. “The Jim Joseph Foundation sought out local funding partners who share our desire to invest in new experiments to reach substantially more Jewish teens. With its experience investing in community-wide programming, strong partnerships – locally and nationally – with Jewish teen education organizations, and interest in the teen audience, Rose Community Foundation is a natural partner for this endeavor,” says Chip Edelsberg, Jim Joseph Foundation executive director. Like Jim Joseph Foundation and others involved, Sperling is concerned with a growing trend of disengagement in Jewish community life, especially by teens. “The Jewish community is such a warm and welcoming place, but by age 13 there’s a drastic drop off in involvement. We want to do something about that,” he says. Those involved also recognize that teenage years are one of the most critical times for addressing the issue. “Teens are at a key developmental age, and if we can help them when they’re developing their identities, we can build the Jewish community in the future,” explains Lisa Farber Miller, Rose Community Foundation senior program officer in Jewish Life. The new initiative is drawing excitement from teens and national funders alike because it takes an innovative look at how to successfully engage Jewish teens. Findings from a 2010 study and Teen Summit we hosted with JEWISHcolorado helped inform and shape the initiative. These learnings and more are being incorporated throughout the initiative. For example, we’ll be launching the Jewish Teens Make It Happen Fellows leadership program to provide micro grants and mentoring for teen-initiated projects that engage their peers in meaningful Jewish experiences. “This could be the breakthrough that really gets Jewish teens engaged again,” says Sperling. Expand Moving Traditions’ gender-based monthly discussion groups for Jewish teens. Expand Jewish Student Connection’s network of Jewish clubs in local high schools and middle schools. Launch a new Boulder Jewish Teen Initiative to facilitate collaboration and new programs for teens at all Boulder synagogues and organizations. Train and support the Jewish Youth Professionals Council, a network of all Jewish youth professionals in Greater Denver as they collaborate to increase teen participation and mentor teens. If you’d like to help support this exciting initiative, we need additional investors. Contact Lisa Farber Miller at lfmiller@rcfdenver.org or 303.398.7420 to learn more. Learn more about Jim Joseph Foundation at jimjosephfoundation.org.